A Trie is an efficient tree structure for storing and searching hierarchically-structured information. For more detailed information you may have a look Here, Here or Here… to mention a few. In this article, I take 'Text' as the information to be handled. 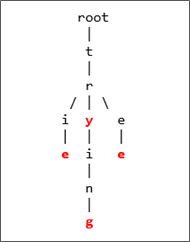 Text can be viewed as a tree of 'character' nodes. Each set of these nodes compose a 'Word' building block. 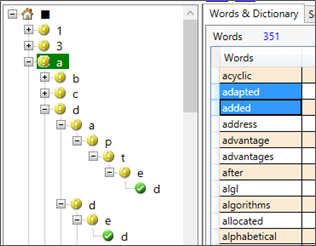 Several 'Words' building block may share a same set of character nodes. In the case of Text, the efficiency of a Trie is that any word of a given text will start with one of the known alphabetical characters of the language used. Which represents a relatively limited number of nodes. To enhance our tree structure, we may choose to compose our root nodes with only characters used in the manipulated text (i.e. dynamically compose our root character dictionary). TrieNode: a trie node item. It refers to one of the above dictionary's nodes. Contains a IsEndOfWord flag that tells whether the node is the end of a word building bloc. And provides information related to its status and position in the tree (Children, Neighbors, IsExpanded…). 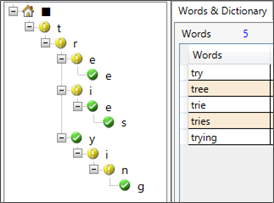 Through its tree position and flags, a TrieNode object can provide us with useful information such as 'words' (Strings) found at its specific position. 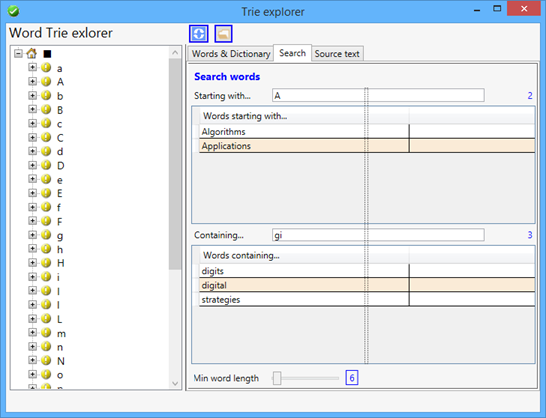 TrieNodeList: a collection of TrieNode items. Trie: is the central object. 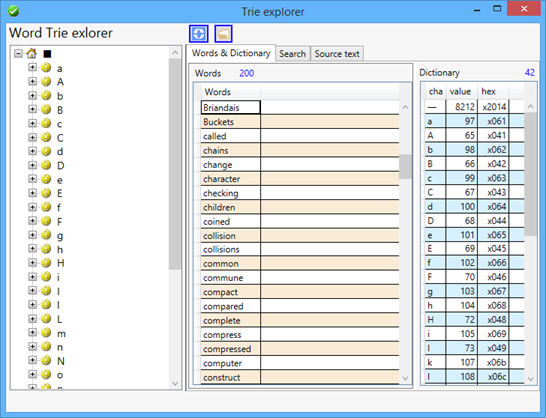 It contains a CharDictionary and a TrieNodeList. 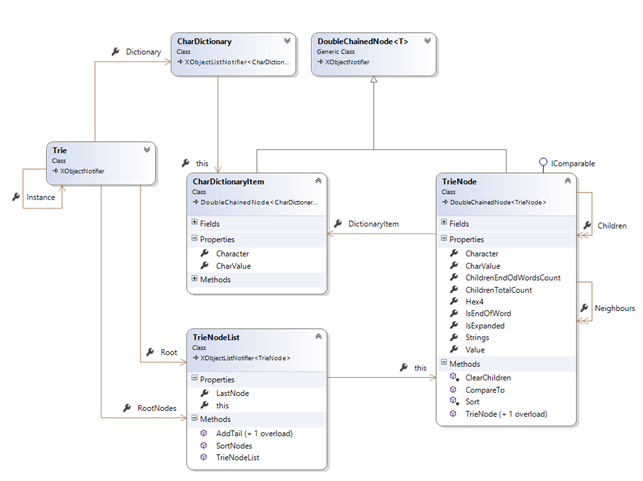 This class is implemented as a singleton in the current sample application. Collections (CharDictionary, TrieNodeList) expose a useful indexer that retrieves an item by its character. Those indexers will be used through the code for retrieving items. ">", "|", "\\", "`", "^", "…", "\t"
How to find back our parsed words through the trie? You may download the source code Here. Have fun optimizing the code and adding new features!